I have been on a huge sun dried tomato kick lately. This sun dried tomato hummus recipe is one of my favorite things lately. I have made it a couple times and I thought I would share it with all of you. Regular hummus can get a bit boring. So sometimes you have to mix it up a bit. If you like hummus, you may also like my Roasted Jalapeno Hummus. Homemade hummus is so easy to make! Soak the sun dried tomaotes in a bowl of water for 30 minutes. Drain and rinse. In a food processor , pulse the chickpeas a couple times to get them started. Then add in the remaining ingredients and mix until smooth. If you want a thinner consistency, add in some water 1 tablespoon at a time until you reach your desired consistency. Keep this hummus in an air tight container in the fridge. It should last at least a week. You can also freeze it for longer storage. Enjoy! Is there any substitute for tahini? It makes my little ones mouths burn! I'm wondering how the cost of homemade hummus compares to store-bought. Any chance you have done a comparison? Of course, I know you can control the ingredients when you make your own, so that is a big plus. Thank you! If you use dried chickpeas, it's much cheaper! Tahini is an expensive up front cost. About $6 a jar. But that jar will make 6 batches of hummus. I haven't done an exact comparison, but I am 100% positive it's cheaper. These are not oil packed sun dried tomatoes? I love anything with SDT. Look forward to trying. Mine were not. They came dried in a bag. If you use the oil packed sun dried tomatoes, you can skip the soaking step. Hi Melissa! I absolutely love your website and all the information you have provided here. I found your site mentioned in the Dr. Oz magazine!! (P. 150 - did you know that?) I am so glad to have found you, it has helped with my transformation/transition to a better & more conscious way to live and eat! Thank you!! Hi Wendy! Thank you! Yes I did hear about that. The girl who wrote the story told me and I bought a copy! Great idea! 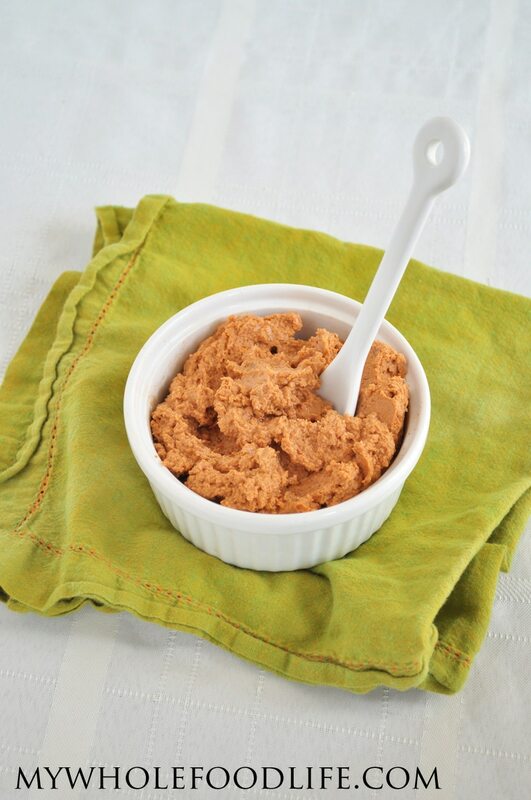 My son loves hummus and it is also a great snack idea to send to school. I am going to try this recipe, sounds yummy! I loved this recipe! So easy and a great variation on regular hummus :) I will definitely be making it again! Hi, Melissa. This is totally off subject, but I LOVE this particular "still life" photograph. The green cloth with the orange hemstitching is FAB-U-LOUS to show off the hummus. And, the best of all? The texture of the cloth - wrinkled and natural. Can you tell I'm a textile freak? LOL Anyway, great pic!! Thanks Marilyn! I wish Foodgawker thought so. They denied this picture.